What Is the Sharpest Drill Bit Metal? What Are HSS Drill Bits? What Are Titanium Drills Used For? Titanium drill bits are a bit of a misnomer. They are not made of pure solid titanium, but rather are made of high carbon tool steel. The steel is given a titanium nitride coating. Since titanium is a very hard metal, a titanium nitride coated bit exceeds the capabilities of a regular tool steel drill bit. Titanium drill bits can bore rivet holes in heavy steel plate. Titanium drill bits are a bit of a misnomer. They are not made of pure solid titanium, but rather are made of high carbon tool steel. The steel is given a titanium nitride coating. Since titanium is a very hard metal, a titanium nitride coated bit exceeds the capabilities of a regular tool steel drill bit. 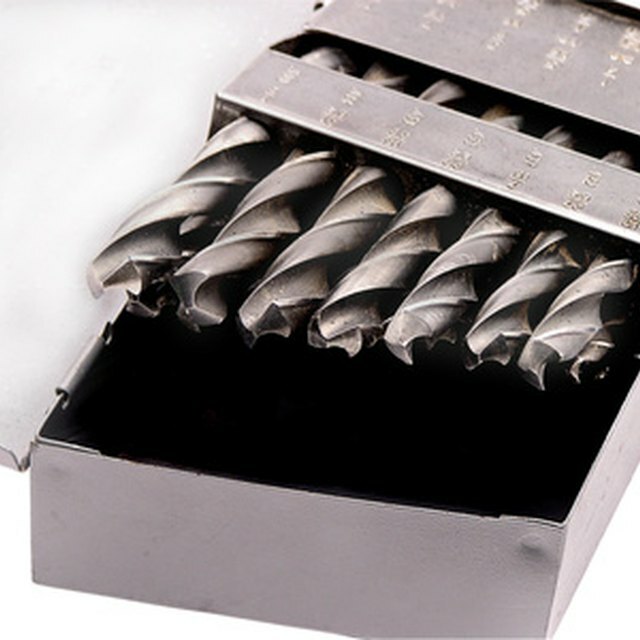 If you are serious about wood or metal working, consider obtaining titanium drill bits. All the common uses are the same as a regular tool steel drill bit. This includes drilling wood, soft metals and plastics. But since titanium is harder than tool steel, the drill bits can bore holes where regular drill bits cannot. This includes hard steel alloys and very hard alloys of stainless steel. An alloy is a mixture of metals. Machine shop instructors recommend using titanium drills for fiberboard, abrasive plastics and hard rubber, and tool professionals recommend titanium or cobalt drills for stainless steel. If a regular drill bit is used on hard metals or on abrasive plastics (such as laminates), it will be adequate at first. However, due to the nature of the materials, the bit will wear out quickly. A dull bit will not "bite," but simply just spin in the hole and get very hot. Another characteristic of all drill bits is they lose their sharp edge, little by little, with each hole drilled. This is a natural occurrence, no matter what material you are drilling. Students at Stanford University built a geodesic dome. They used 65 soft steel electrical conduits for the struts. Having a hole at each end, they had to drill 130 holes. The students used titanium drill bits. Even though they used titanium drill bits, they still had to use at least four, because the bits would wear out with the drilling. Some materials, especially stainless steel, "work hardens" very quickly. To visualize work hardening, bend a piece of wire back and forth repeatedly. Eventually, it will break. The reason it breaks is called metal fatigue caused by work hardening. The molecules pack closer together, so the metal actually becomes harder. For this reason, you have to drill hard and fast through stainless steel to prevent work hardening of the workpiece. You cannot do this with a regular bit, since the heat produced will soften the drill bit. The old saying "don't lose your temper" comes from an overheated tool, losing its temper (hardness) because of overheating. A titanium bit will not lose its temper when it spins very fast, and you drive it with force into the workpiece. A titanium drill and a regular tool steel drill bit are the same size. For example, a 1/4 inch titanium bit is the same size as a 1/4 inch regular tool steel bit. The design engineers made it easy. You don't have to worry about converting sizes, since all the sizes are the same for both regular and titanium bits. What Do I Use for Cleaning Deer Head Mounts? What Products Will Clean a Dirty Old Kitchen Floor? How Does a Wood Chipper Work?